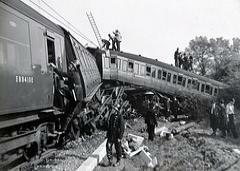 In 1961 two serious rail accidents occured on each of the two lines serving Pitsea railway station. Both of the accidents resulted in the loss of life and injuries to many others. Prior to these accidents the last incident involving a fatality is believed to have occurred in 1956 of which more can be read further down this page. The first accident involved the 12:25 Fenchurch Street to Shoeburyness service. The train, which was carrying around 150 passengers, was travelling on the Up line in the Down direction; the line at the time of the incident was being worked as single only part way between Laindon and Pitsea due to the then ongoing electrification engineering work. At around 1:34 pm confusion involving the catch points resulted in the steam tank locomotive No. 80075 being derailed along with the first four coaches of the eleven coach train. 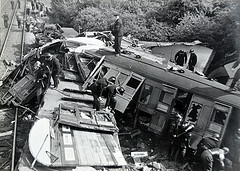 The locomotive ended up on its side leading to extensive damage to the first four carriages causing the death of two passengers and injuries to forty six others. The accident made the national headlines and news teams with a film crew were soon on the scene. The following day in the house of commons the Minister of Transport Ernest Marples in response to a question from the MP for Billericay Edward Gardner gave a detailed statement of the tragic events. He made note that an emergency bus service was in operation between Pitsea and Laindon and that rush hour trains were diverted via Tilbury to all stops beyond Pitsea. Normal services had resumed by Wednesday 19th July. Copyright Information: This document is Crown Copyright. Publisher: Ministry of Transport, Her Majesty's Stationery Office, 1961.
and white news clip. ITN News Clip. The second accident involved the 10:05 am Tilbury to Thorpe Bay service. The eight coach train on its approach to Pitsea station struck a tipper lorry on the Marsh Road Pitsea Hall Occupation level crossing resulting in the death of the lorry driver and seriously injuring a female pedestrian at the scene. The lorry was conveying spoil to Pitsea tip from building sites during the creation of the new town. The crossing was unmanned at the time and the train drivers view was impaired by stationary wagons in an adjacent siding. The locomotive and carriages remained on the rails throughtout the incident. The deceased lorry driver Mr. W. Pound was employed by building contractors Thomas Bates & Son and had driven to Pitsea in a small convoy with two other lorries, also laden with spoil. If you are unable to read PDF documents you can download the free Adobe Reader. If you already have the Adobe reader but receive the error message: "The file is damaged and could not be repaired", you probably have an earlier version of the reader which needs to be updated to the current version. On Thursday 11th October, 1956 George Saunders, a retired master baker from Vange, was killed on an unmanned occupation level crossing leading to Kiln Farm, Vange. He was on a visit to the farm when his stationary car was struck by a passenger train coming from the direction of Stanford-le-Hope. Although he wasn't in the car the cause of his death was due to being struck by the vehicle following its initial impact with the train. A jury at the subsequent inquest returned a verdict of accidental death. George Thomas Saunders, known as "Doughy" Saunders, ran the record bakery at 93 High Road, Vange, which he established with his brother Walter around 1913. He was very well known locally and often led the Pitsea & Vange Carnival on horseback dressed as the 18th century imaginary character John Bull, the personification of Great Britain. He lived at Kestell House, Timberlog Lane and was also a founding member of Pitsea Masonic Lodge. He was succeeded in the business by his son Thomas who ran the shop until 1963; selling out to the development corporation who demolished it in preparation for future development planned for Vange. The record bakery was the first shop after the Barge public house. The building was semi-detached with upper living accommodation. The shop next door for many years was Douglas Royce's gentlemens hairdressers, which after the bakery closed and moved opposite to 62 High Road. The shops were demolished around 1964. Text researched and written by William Cox, 2014. Copyright © 2014, B.Cox, Basildon History Online. All rights reserved.